The spectacular scenery of Knysna is, undoubtedly, its most precious asset. The Indian Ocean tumbles through two mountain faces called The Heads. Together, these sandstone cliffs form a narrow channel, which connects the lagoon and estuary to the wild waters of the sea. Walking trails up The Heads reveal awe-inspiring views, not only of the impressive channel, but also of the tranquil lagoon that stretches to the horizon, lush forests and the mountains that they adorn. In fact, these views are, in whole or in part, something that can be enjoyed from just about any part of Knysna. Knysna is also ideally situated. It is very close to Plettenberg Bay, Tsitsikamma and Storms River, George and Mossel Bay. It is only a four- to five-hour drive from Cape Town and less than three hours from Port Elizabeth. This central location makes Knysna an ideal base from which to explore the beauty of South Africa. The gorgeous natural abundance of flora means that there is plenty in the way of wildlife for nature-lovers to enjoy. The birdlife is particularly prolific and guarantees magnificent bird-watching for avian enthusiasts. The area is famous for the Knysna Loerie. This bird is striking for its brilliant colours of bright green, intense red and stark white. 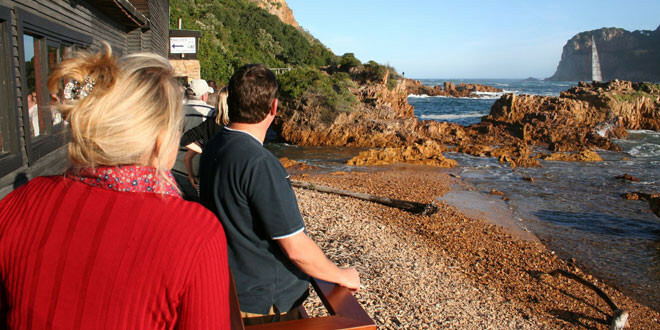 Being such a popular tourist destination, Knysna has plenty of exciting activities and fascinating sights to explore. The Knysna Elephant Park – a sanctuary for the mammoth African Elephant. Buffalo Bay – a family beach that is ideal for swimming, sun-tanning and long walks. The Simola Golf Estate – an 18-hole course designed by the world-renowned Jack Nicklaus. The Featherbed Nature Reserve and the Goukamma Nature Reserve. Shopping – Knysna is absolutely brimming with awesome boutiques, galleries, designer shops, décor outlets and so much more. This is shoppers’ paradise. The Millwood Goldmine Tours – visit one of the first gold mines ever established in South Africa. The forests – the dense vegetation that characterises this entire region is exquisite to explore. There are a number of walking trails through the forests, as well as horse riding trails. The forest remains cool under the impenetrable canopy, which is home to countless bird species. The Knysna Oyster Festival – this takes place every year, inviting people from all over the world to sample some of the best oysters (as well as other food and beverages) available. Shark cage diving – feel the thrill of meeting a Great White up close and personal from the safety of a cage. These magnificent hunters are beautiful in their own rights and their power is impressive. The Outeniqua Choo-Tjoe steam train – this old-fashioned train used to travel from George to Knysna through some of the most stunning coastal areas imaginable. Knysna tells the story of a side of South Africa that is relatively unknown to the rest of the world. This element of its heritage is set against the splendour of a backdrop that must be experienced to appreciate.